I came up with this recipe last weekend and have since wondered if it was suitable since its Mothers Day this weekend. 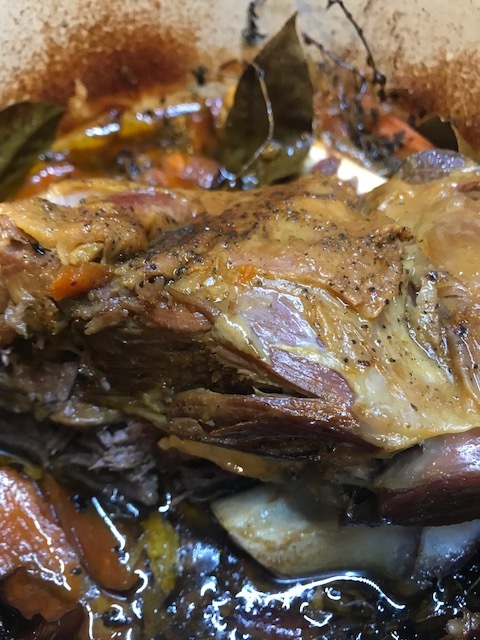 My girls said ‘of course’ and reminded me it is a fun take on a Sunday roast. 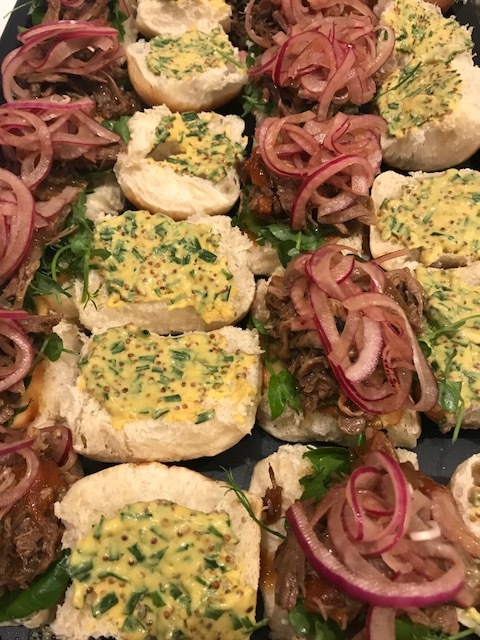 You can choose whether you treat it as a slow cooked roast or turn it into something easy like these sliders. 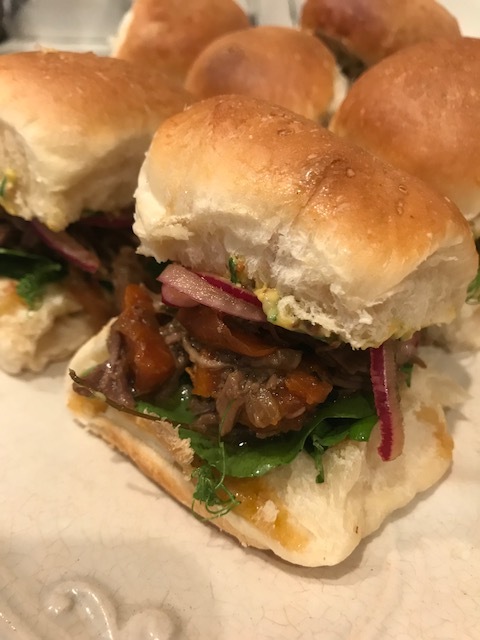 I went for the sliders and we ended up having 3 each! We used 2 varieties of English cheddar that we now sell – one is aged and the other smoked. Both were delicious and great melted. The red onion quickly pickled in stallholder Naomi’s quality Italian balsamic vinegar was also a hit. I envisage doing the onion again to eat with a lot of things. We brought the slider buns from a supermarket. Whatever you decide on make sure they are soft and not a heavy bread. Preheat the oven to 150C. Place the chopped onions, carrots and garlic cloves in a lidded casserole dish and nestle the leg of lamb into it. Season with salt and pepper and tuck in all the fresh herbs. If you are using mince, season and shape it into patties. Then panfry. Cook the leg of lamb for 4 hours. Halfway through cooking pour in the stock and cover for another 2 hours. Once its ready remove the lamb and rest for about 10 minutes. Using a couple of forks shred the meat from the bone. Put the meat back in with vegetables and mix well. You may need to add a little more water. Place the red onion slices in a bowl and add the balsamic and sugar. Mix well. After 5 minutes give the onions a squeeze with you hands. This helps with the pickling. If you need to use immediately its fine. 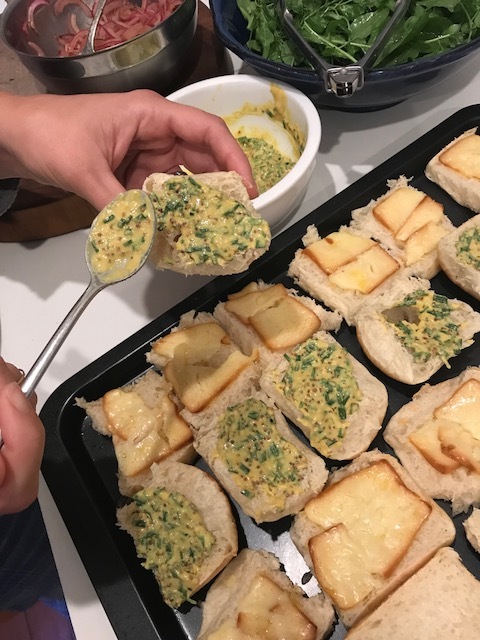 Mix together the mustards and chives in another small bowl. This is for spreading on one side of the slider buns. Cut the buns in half and place on an oven tray cuts sides up. On the bottom side of each slider place a slice or two of cheese, then place the tray under a hot grill in the oven. Let everyone assemble their own sliders. We assembled our own by smearing the non-cheese side of the bun with the mustard mix. A heap of the lamb went on top of the cheese and finally we added a dollop of balsamic onion. Join the halves together. We all then munched away happily!